Bill Clinton’s foray into co-authoring a novel is an awkward hybrid of cyber thriller and reflections on the loneliness and responsibility of high political office. 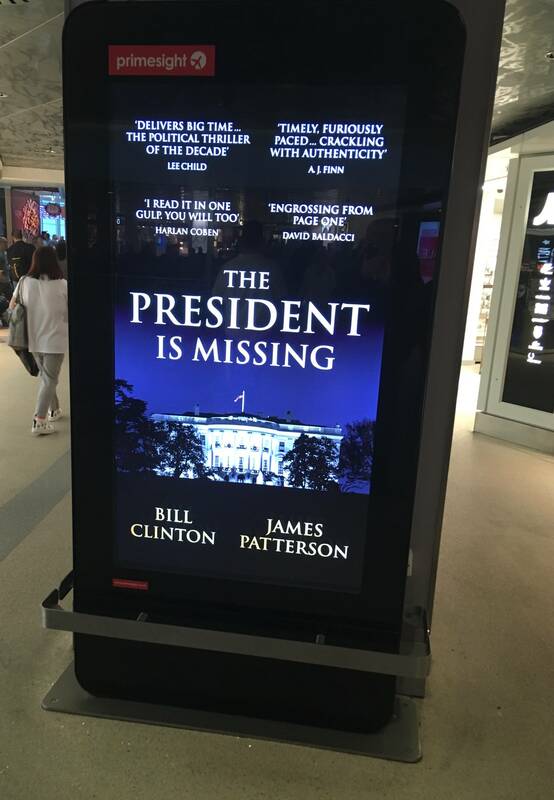 The President Is Missing, co-written with prolific potboiler author and Stephen King botherer James Patterson, plays with a familiar trope: the leader of the free world as an action hero. In the book, the fictional President Jon Duncan is given five days to prevent a cataclysmic cyber attack that would erase financial records, disable the power grid, break water purification systems and disable mobile phone networks. Yes that’s right: it’s a cyber Pearl Harbour. As if that’s not enough, President Duncan is also facing impeachment proceedings while coping with a long term health condition and fending off a pregnant would-be assassin and her cohorts. The fictional president, a former governor of a southern US state (remind you of anyone?) and widower, responds to all this stress by going off-grid to sort things out. According to former Clinton Secret Service man Gary Byrne, the former president was allegedly able to give his Secret Service protectors the slip several times. This possibility of ditching the detail gives The President Is Missing one of its central plot elements. The fictional prez, a former Army Ranger and Gulf War veteran, adopts his disguise before making his way out of the White House through a secret tunnel and meeting a hacker who, having helped to make and plant a devastating wiper strain of malware, has second thoughts about bringing down western civilisation. The book meshes elements of the Kiefer Sutherland-starring jeopardy series 24 plot with elements of Die Hard 4 and themes of betrayal from House of Cards. The prose is as pedestrian as Stephen King might expect, and best compared to the Da Vinci Code. The plot is functional enough but the characters, including female Bosnian assassin Bach, are mere ciphers that don’t linger in the imagination after reading the book. There is quite a lot of reflection on the people who enter politics and Democratic talking points that would sit more naturally in a memoir or political diary. Those reading the novel for insights into the US political process or what it’s like to be president will find points of interest. Parts of the book, such as a passage relating the telephoning the mother of a dead soldier, have the mark of authenticity. The literary running mates – Clinton and Patterson – have read the Cliff Notes but they don’t really know a great deal about cyber, elements of which are used to season the pot of what in essence remains a would-be airport blockbuster. The book is 513 pages in hardcover but split into 10 page chapters for easy digestion. Unsurprisingly, the Russians are the cyber antagonists in the book. The real-life Russian government hacking crew, Fancy Bear (APT28, a unit of Russian military intelligence or GRU), even gets a name-check. The Russians act through a proxy group called the Sons of Jihad, who (despite their name) are nationalists rather than jihadists. Duncan’s impeachment proceedings stem from a phone call to the leader of the group, during which he uncovers a plot to unleash a virus so horrible it is called the Dark Ages. The cyber attack itself is rather pedestrian – a wiper. Even university security operation centre staff these days train on simulations with multiple attack vectors (hacking, malware, DDoS etc). The malware-based "McGuffin" at the centre of the action does have advanced (not to say almost magical cloaking) abilities that make it hard to defuse. It’s a bit better than CSI: Cyber, but then what isn’t? There are already plans from Showtime to turn the book into a 16 part series.